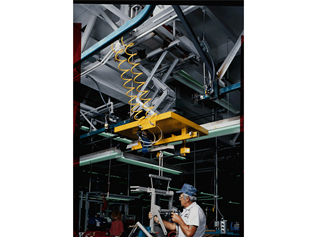 April 13, 2016 - "Capabilities "
Customer retrofits an existing assembly line with an overhead lifting mechanism that provides variable vertical and lateral adjustment of the product being assembled, thereby improving worker productivity. A major producer of hospital furniture was challenged with making their assembly process more ergonomically effective for employees by installing equipment that could vary the height of the product as it moved down the assembly line. There could be no major modifications to the overhead cranes system, and overhead space was limited. The ultimate equipment solution had to: 1) be low profile, 2) have two axes of movement (up-down, forward-reverse), 3) be cost effective. Through the use of this customized scissor lift, the work station area has been cost-efficiently updated to include a vital worker productivity improvement with minimal overhead space consumed, and zero impact to the floor space required to perform the assembly process.